We have just come up on the 1 year anniversary of our climb to the summit of Mount Fuji; it is amazing to have the memories of the climb and none of shivering and aching feet. This got me thinking about all the amazing fun we had while in Japan. Part of what makes Japan such a great place to visit is its unique sights and delicious food. Aside from these amazing attributes, Japan has a lot of other things going for it. So here goes! The streets of Japan are really litter free and well maintained. As you travel around the country you will be shocked that even Tokyo, a bustling city of over 13 million people can be so clean. One of the things I get a huge kick out of is that most taxi doors in Japan open automatically. So don’t freak out when you go to grab the handle and the door pops open by itself! In addition to the delicious Japanese food, there are a lot of bakeries in Tokyo, and are surprisingly delicious. We actually visited this one boulangerie on one of our stays almost daily because the breads were so yummy! So the subway/trains are actually both a blessing and a curse. 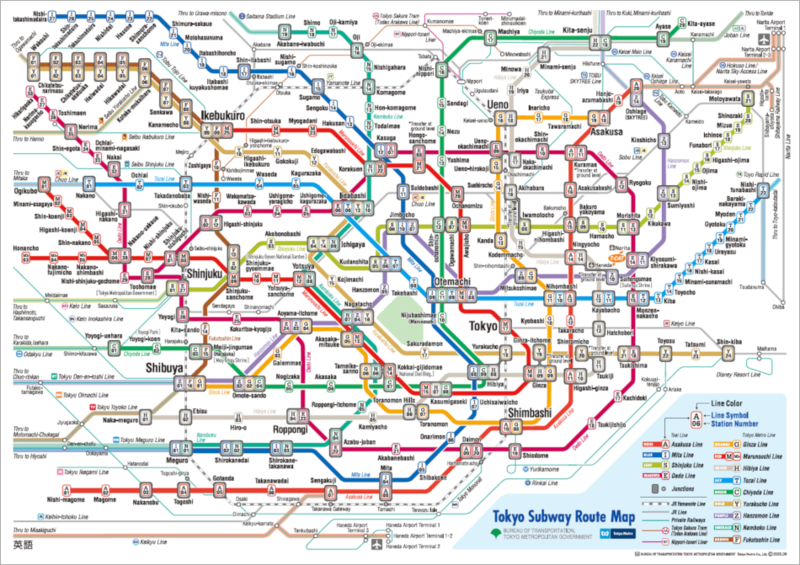 Japan has so many subway/train lines and they can take you all over the country. They even have the Shinkansen which is their bullet train that goes up to 320 km/h (almost 200 mph)! WOW! Interestingly enough, the subway/trains are privately owned and as a result the lines aren’t super seamless, as in they don’t all connect. When you’re looking at the map, it’s like a little kid dumped their Crayola box on the table and went to town! The high tech bathrooms in Japan will surprise you. We saw some 3-in-1 sinks that dispensed soap, water and dried your hands all out of the same nozzle! There are also bidets even in the smallest mom and pop restaurant. It’s not surprising that even kids have a bidets in their bathroom; look at this hello kitty bidet, wouldn’t that look adorable at your house?! The Japanese take self-serve to new heights with vending machines to order and pay for your food. It will spit out a ticket, and when your number is called, you go pick up your food. These are just some of the things that make Japan truly a unique country and wonderful culture to experience. Of course there are many sights to see that are both unique and historical, but the little nuances of the culture and daily life really make a trip to the country a one-of-a-kind experience! Make sure to check out some of my other blog posts about our visits to Japan.